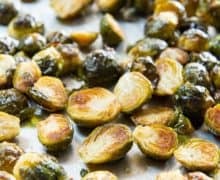 Here’s how to make the Best Roasted Brussel Sprouts that are perfectly golden and caramelized on the edges, but not dried out. If you need help loving brussel sprouts, this is the way you do it. They’re SO good roasted! Making a big tray of these is one of my staples for weeknight dinner, and it’s a hit every time. The key is to get the brussel sprouts golden brown and caramelized on the edges, but still tender in the middle. Sometimes people roast them too long in order to get them golden, but then they dry out. 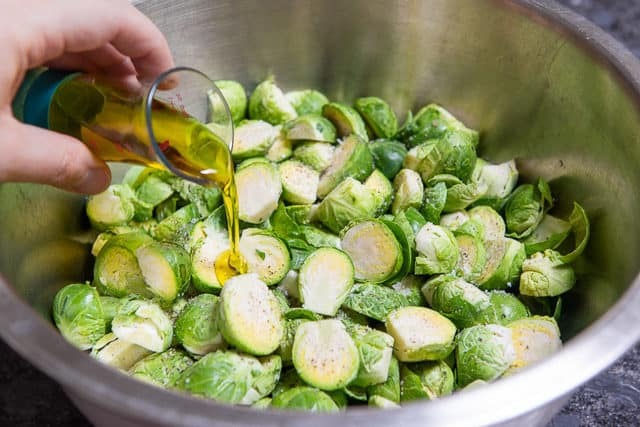 The key is to set the brussel sprouts up to maximize browning, and use placement in the oven to get them perfectly cooked. I’ll show you how. It’s easier AND more effective to toss the ingredients in a big mixing bowl, rather than trying to do it on the sheet pan. It does dirty a bowl, but the oil disperses much more evenly, which will help them brown evenly. 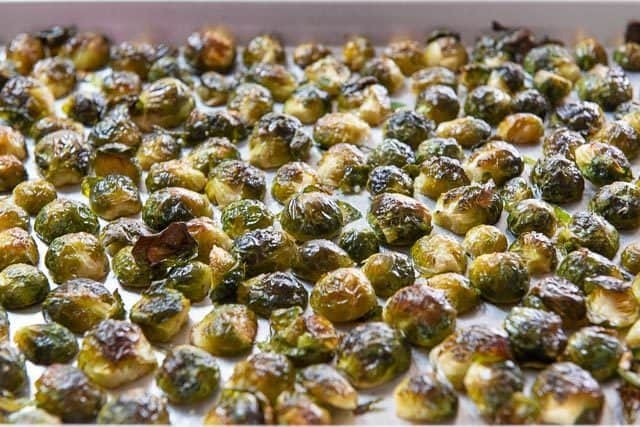 Spread the brussel sprouts onto a rimmed sheet pan, with the cut side facing down. Make sure there’s a little bit of space between the brussel sprouts, and that they’re in a single layer (and not piled up on top of each other). This ensures that they will brown. Here I have two pounds of brussel sprouts on a half sheet pan, which is about the maximum you should do to ensure they have space. It varies depending on size, but roast for about 25-30 minutes. At that point they should be tender and golden on the outsides. If they are not golden enough on the bottom, then put the sheet tray back into the oven, setting it on the bottom floor of the oven. This is assuming you have a gas oven. If you have an electric coil on the bottom of your oven, then adjust the rack so that it sits right above the coil, and put the tray on that. Continue roasting the brussel sprouts for 2-3 minutes, checking for brownness on the bottom. The intense close heat should brown them sufficiently within a couple minutes. Then they’re ready to serve, either as is, with a fresh grating of Parmesan cheese, or whatever you’d like. Pork Tenderloin pairs beautifully with this side, as well as Beef Wellington and Parmesan Crusted Chicken. Enjoy! How long are Roasted Brussel Sprouts good for? Leftovers will last in the fridge for 3-4 days, but keep in mind that brussel sprouts get kind of stinky as leftovers. They taste best freshly roasted. 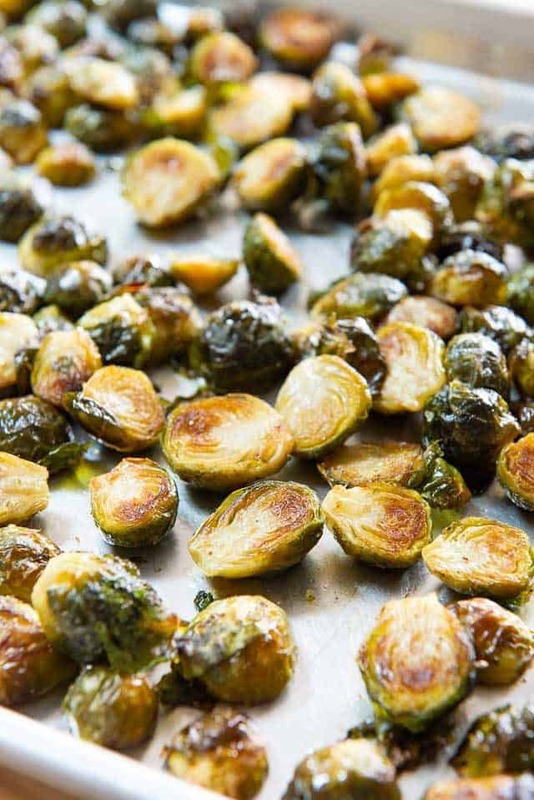 Can Roasted Brussel Sprouts be Reheated? Yes, in the oven, in a skillet, or in the microwave. The microwave is easiest but will make them a little bit soggy, so you may want to reheat in the oven or skillet until warm. 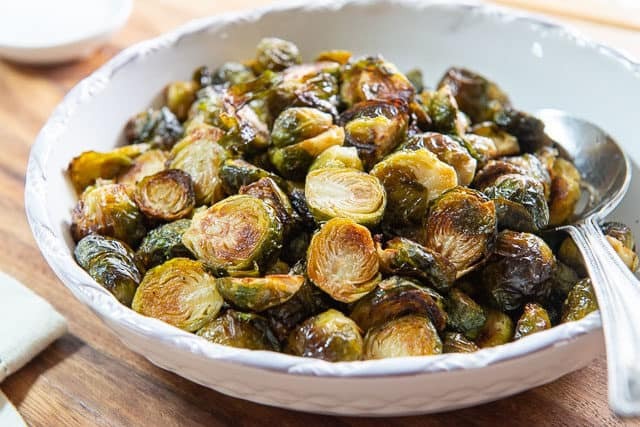 Are Roasted Brussel Sprouts healthy? Yes, very! 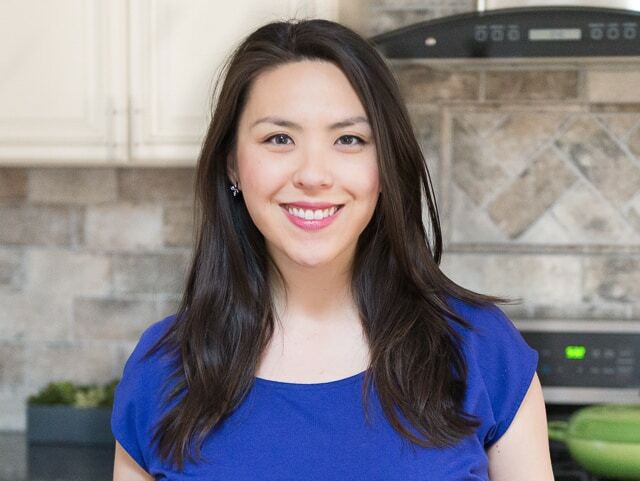 They’re suited to nearly every dietary style as well, being gluten-free, dairy-free, vegan, vegetarian, Whole30-compliant, and more. These Roasted Brussel Sprouts are golden and caramelized on the edges, but not dried out. They're simple to make, and a great side for many meals! Trim and halve the brussel sprouts, and place in a large mixing bowl. 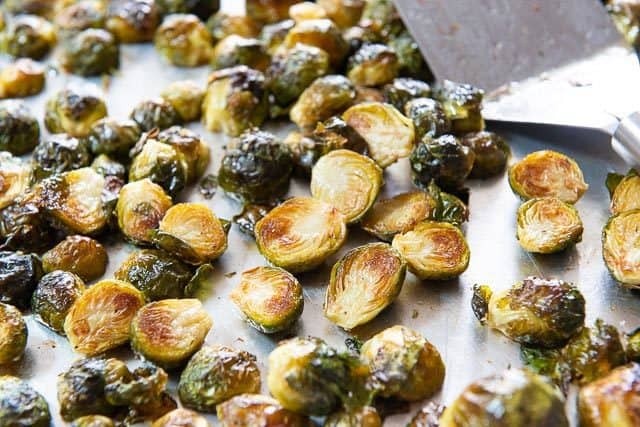 Toss the brussel sprouts with the olive oil, salt and pepper, and spread them out on a sheet pan, cut side down. Roast for 25-30 minutes (it depends on size), until they're tender and have browned and caramelized on the bottom and edges. 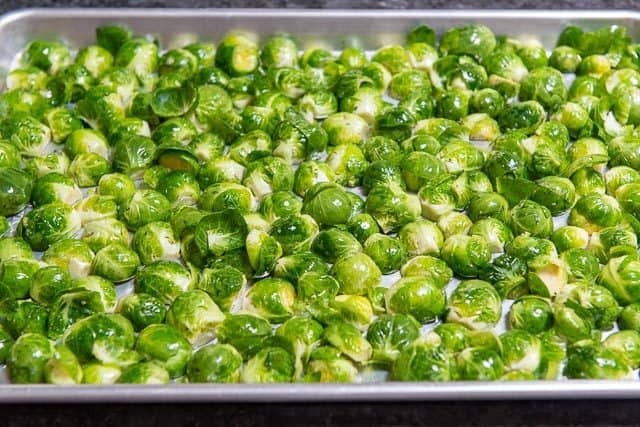 If the brussel sprouts are not sufficiently browned on the bottom, place them on the oven floor and cook for another 2-3 minutes, until well-browned. Keep your eye on them so they don't get burned. If you have an electric oven with a coil on the bottom, position a rack right above it and roast. Serve promptly while warm, and enjoy! *Since salts vary in "saltiness," you'll need to learn the perfect amount for your taste. 3/4 tsp is a good starting point, and this is how much I prefer (I use kosher salt). If you're concerned about salt, you can always start with a little bit, then add more at the end. Post updated in December 2018. Originally published March 2011. This looks like an amazing side for an awesome Sunday roast! 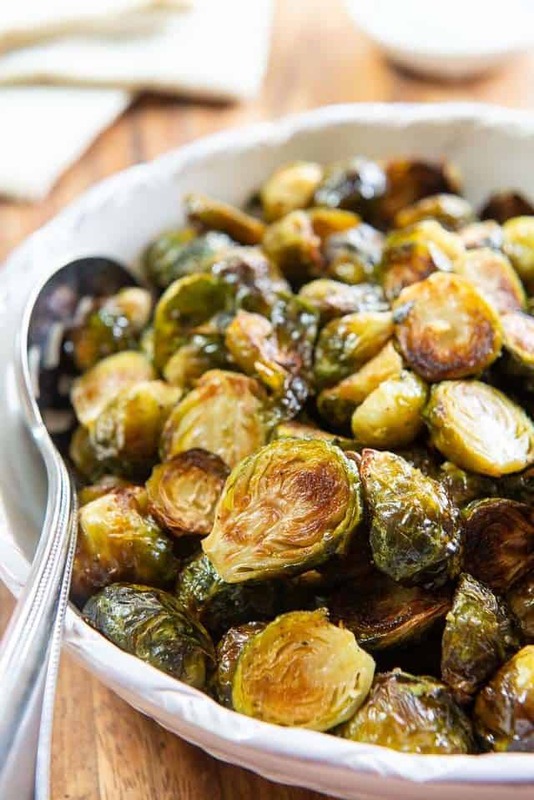 The idea of using plenty of pepper on brussels sprouts is definitely appealing!